December 12 is a sacred day in this ancient land of the Aztecs as faithful residents and visitors from around the world pay homage to the Virgin of Guadalupe, Mexico's patron saint. According to official Catholic records, the Virgen de Guadalupe - also known as the Virgen de Tepeyac - appeared as a young girl to the recently converted Aztec boy, Juan Diego on the morning of Dec. 9, 1531 (soon after the Spanish conquest) on the Hill of Tepeyac, near Mexico City. In pre-Hispanic times, Tepeyac had housed a temple dedicated to fertility goddess Tonantzín, "mother of the gods" and the area had been an important pilgrimage place for residents of the nearby capital city of Tenochtitlán. Following the conquest by Hernán Cortez in 1521, the shrine was demolished, and the natives were banned from going to the site. According to the legend, Juan was passing by the hill on his way to church in another town when he heard someone calling to him. He climbed the "forbidden hill," where he found a young girl - who seemed no more than 14 years old - cloaked in a beautiful blue shawl, standing in a golden mist. Speaking to him in his native Nahuatl, she instructed him to ask the bishop to build a church in her honor on that site. After Juan reported this meeting to Spanish Archbishop Fray Juan de Zumárraga, the skeptical "man of the cloth" instructed Juan to ask the "lady" for some miraculous proof of her identity. The following day, Juan's uncle was mysteriously healed after a long illness, a feat which didn't convince the doubting bishop. 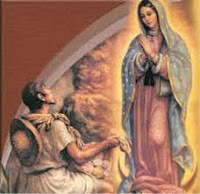 The Virgin then asked Juan to gather flowers from the normally barren hilltop. Despite the fact that it was December and way past the normal blooming season, Juan found Castilian roses (not native to Mexico) and took them to the lady. She placed them in Juan's peasant cloak or tilma and sent him back to the bishop. When he opened his cloak before the bishop on December 12, the flowers spilled onto the floor and the image of the Virgin of Guadalupe was imprinted on his cloak. The image was that of a young woman without child, her head lowered demurely. Wearing an open crown and flowing gown, she stood upon a half moon. 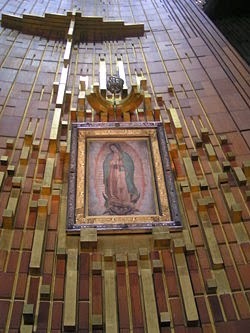 Soon after, the bishop began construction of the church - where Juan's cloak with the image of Our Lady of Guadalupe was displayed. The original shrine was rebuilt several times over the centuries, most recently in 1976. 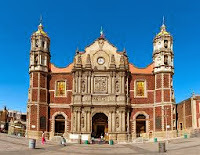 Today, the "old Basilica" stands next to a "new" one, designed by Architect Pedro Ramirez Vasquez. The new circular floor plan allows the image of the Virgin on the cloak to be seen from any point in the Basilica. Juan Diego's cloak is preserved behind bulletproof glass and hangs 25 ft above the main altar and, after more than 450 years the colors of the image remain as bright as if they had painted yesterday. The coarsely-woven cactus cloth of the shawl, which seldom lasts more than 25 years, shows no evidence of decay. The immense plaza leading to the Basilica can hold 50,000 worshippers. Today, more than 12 million faithful visit the Basilica every year, making it the second most visited church in the world, after St. Peter's in Rome. Throughout the year, pilgrims converge on the sacred site - often on their knees - to honor the Virgin. As news of the apparition spread, combined with the fact that the mother of the Christian God had appeared to one of "their own" and spoken to him in their native language, was enough to send Indians in droves from hundreds of miles away to see the sacred shawl. 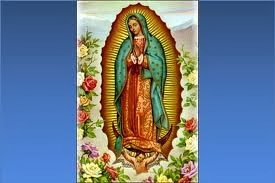 The miraculous image was to have a powerful influence on the conversion of the peoples of Mexico to Catholicism. From 1532 to 1538, more than eight million Indians were converted to Christianity. On May 25, 1754, Pope Benedict XIV declared Our Lady of Guadalupe patron of what was then New Spain, including Central America, and approved liturgical texts for the Holy Mass in her honor. Pope John Paul II visited the shrine in January 1979, and again when he beatified Juan Diego there on May 6, 1990. 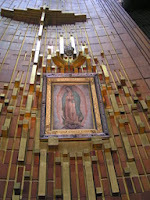 In January 1999, Our Lady of Guadalupe was named patron saint of the Americas. Juan Diego was canonized in 2002 as the first indigenous North American saint. December 12 is also the informal kick-off of the very festive Christmas season in Mexico, ending with the Epiphany on January 6. The "old Basilica," built between 1695 - 1709 is located to the side of the "new Basilica." Behind it is a small museum which houses restored religious art and artifacts. The museum is open from 10 am to 6 pm Tuesday to Sunday. Closed Mondays. Nearby, are steps leading to the Capilla del Cerrito (Chapel of the Hill), which was erected on the spot where the Virgin appeared to Juan Diego. The Basilica de Guadalupe is located in the northern part of Mexico City in an area called Villa de Guadalupe Hidalgo or simply "la Villa." By taxi: Take any taxi from an "authorized" taxi stand, or from your hotel. All drivers know how to get there and they have a set rate. By metro: Take the metro to La Villa station, then walk north two blocks along Calzada de Guadalupe. By bus: Take any bus along Paseo de la Reforma, running north-east that says "La Villa." Thanks for sharing this bit of history and culture! My pleasure. I'm always happy to spread the word about Mexico's treasures! 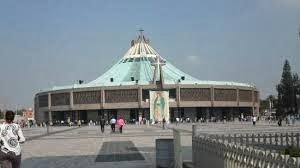 We were able to visit the Basilica of the Virgen de Guadelupe on our trip to Mexico City in 2012. To me, the Virgen of Guadelupe is quintessentially representative of Mexico, her people and her history. When I lived in Mexico at ages 9-10, I attended Catholic school even though my parents' religious affiliation can best be described as non-existent. I still have a deep affection for the Virgen de Guadelupe and she watches me cook dinner every night from her perch as a magnet on our refrigerator. I agree. I became a believer too after living in Mexico City for nearly 20 years. Thank you for the insight. When reading about the history and culture that is still celebrated really make modern day problems seem so trivial. You are so right. We need more of that. What a comprehensive post! Where we live in Oaxaca the Virgin of Guadaloupe is highly revered and you can see her image and shrines on street corners, shopping bags, taxis, buses and pretty much everywhere. Next time I get to Mexico City I'll definitely visit the Basilica. From your description it sounds amazing. Thank you. It truly is a mystical experience!